In the previous article, we talked about trading and probability. Continuing to develop this topic, let's talk about trading and luck. What is the relation between these two concepts? Can a trader count on luck to get profit? Is it possible to suffer from bad luck in trading? Technical analysts propagate the idea that there are sense and consistency to the market and there's much to be said in favor of that. After all, there are trends and patterns on charts that get replicated from time to time. However, there's still a lot of noise, i.e. moves of the price that can be explained by analysts only a posteriori but not as or before they happen. This noise can mess up with a trader's position. On the other hand, if things go just as a trader thought they would without any surprises from the market, a trader may consider himself/herself lucky. There seems to be a big element of randomness here. Are there any traceable borders of the randomness we observe in financial markets? Maybe the swings of the price, even the minor ones, are not random, it's just that people are not able to see the governing principle? How strongly a trader's success depends on skills and how much does it rely on luck? The authors who researched this idea a lot - Nassim Taleb, Michael Mauboussin, and Robert H. Frank - came to the unexpected conclusion that talent and eﬀorts are not enough to succeed in the modern world, you should actually find yourself in the right place at the right time. It means that if we look at some traders who absolutely nailed it, it might seem that their success is the natural result of all the actions they have made. The reality, however, is much more complex. Most great achievements are to some extent marked by randomness. As the sociologist Duncan J. Watts cleverly indicates in the name of his book "Everything Is Obvious: Once You Know the Answer", people have hindsight bias and underestimate the role of luck, randomness, chance, or whatever you call it. The conclusion is that a trader's performance is a summary of skills and luck, the proportion of each unknown. So, it's not all up to us and the role of chance in our life can be big enough, even though we don't always realize that. Where does this idea can lead? It is abundantly clear is that one cannot rely on the mere luck while trading. Otherwise, there would be no real need for the word "trading" as "gambling" would suffice. A person can shape the world around him and doubting this idea will get you nowhere. At the same time, remember that you are not the master of the market and you can't wield it as you wish. The price won't go up just because you opened a buy trade and in no way can one trader beat the avalanche of the market. The sin of overconfidence will be sternly punished by the market. So, what's the best option here? 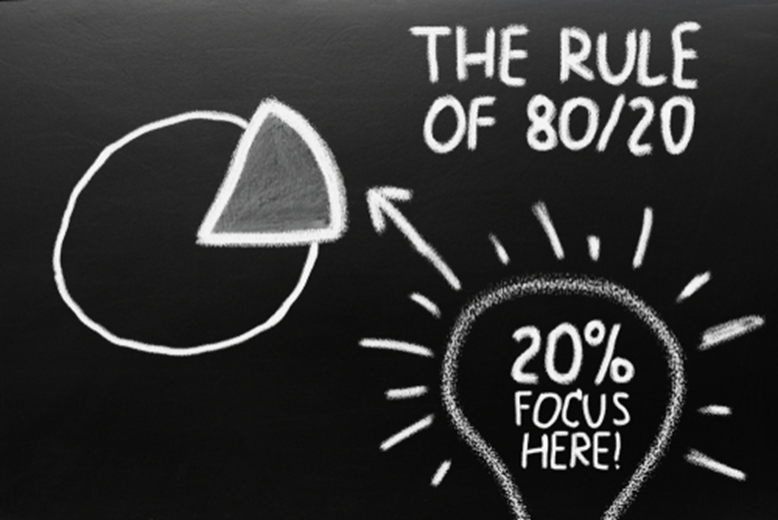 You have probably heard about a pattern called the Pareto Principle (we wouldn't go as far as to call it an objective law). It says that 80% of the results are achieved with only 20% of the total efforts. That, of course, doesn't mean that you should twiddle your thumbs and reduce the number of efforts you make to achieve your goals. What it means is that by definition not all of your trades will be successful and only a fifth of them will likely account for the main chunk of your gains. Evidently your risk/reward ratio should be better than 1:1. Another idea to ponder is related to the time you spend on trading. If only 20% of it is really efficient, it's worth examining what you do during the remaining 80% and try to optimize it. There's always a way to improve productivity. For example, maybe you can spare a while for the analysis of your own trades? To sum up, we can say that as with many things, it's hard to give an unambiguous answer about what really leads a trader to success. Various factors are so closely intertwined that it's hard to separate them. It's a fact that good mathematicians and well-read economists won't necessarily make successful Forex traders. An understanding of price action mechanics comes to a trader over time. Experience will help you develop market intuition and an ability to control your emotions. And you'll definitely need some luck, but the necessity of luck should in no way limit your work on self-improvement. Remember that the disciplined risk management, the healthy mental state, reasonable expectations and actions, and the willingness to learn and practice are the things which will help you use your luck with 100% efficiency.